Above is a picture of Governor Sarah Palin this morning….in Iowa with a crowd. 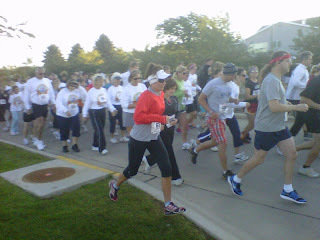 She is running and the pic was taken in Storm Lake, Iowa in a 1/2 marathon. By the way, I understand she had a very good running time…I am trying to get that for you. Sarah Palin’s short-lived and unannounced run began and ended today in Storm Lake, Iowa. 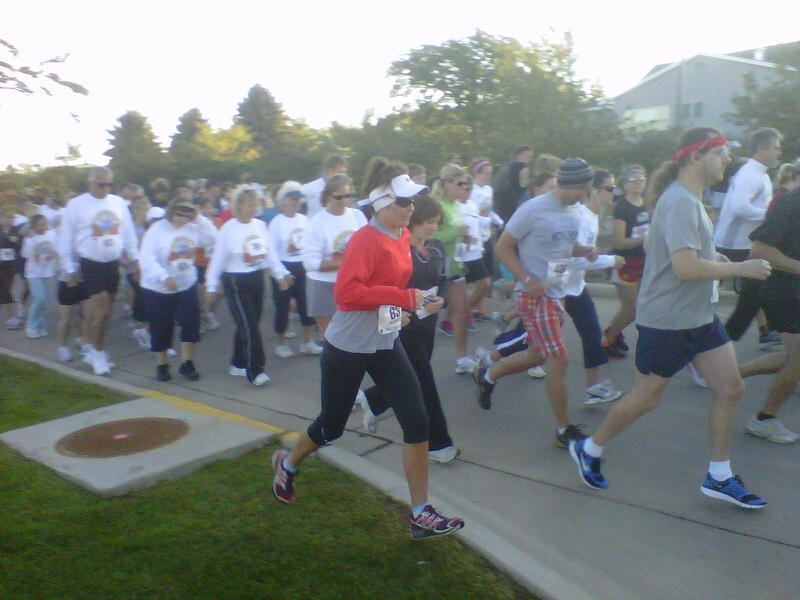 The morning after Palin’s speech at a tea party rally in Indianola, Greta Van Susteren of Fox News posted a photo she said was snapped of Palin during the “Jump Right in and Run” half-marathon organized by the Storm Lake Running Club. Hannah Campbell, webmaster of the Storm Lake Running Club, confirmed the former Alaska governor’s participation in the event. She said Palin’s official time was 1 hour 46 minutes 10 seconds. The unpublicized stop by Palin is odd, but it’s not the first. She made a silent visit to the World War One Liberty Memorial in Kansas City last month. Curiously, the name Palin isn’t listed anywhere on the race records. But there is a mysterious second-place finisher under the age “40-49 Results – Women” results named Sarah Heath. She listed herself as from Des Moines. Heath is Palin’s maiden name. The runner is listed also as 47 years old — the same age as Palin. Campbell confirmed that Palin ran under her former name. Doug Adams, the former potato chip salesman who founded the Iowans4Palin website last year, was asleep Sunday morning at home in Storm Lake, Iowa, when his wife, Diane, woke him up with a panicky phone call. Diane told him to get down to the lake post-haste. Sarah and Todd Palin were there, and Sarah was about to run the half-marathon. Diane had risen early to walk the course. Adams thought his wife was joking at first, since they had just returned the night before from Indianola, more than 150 miles from Storm Lake, where they’d trekked to watch Palin’s “tea party” speech Saturday afternoon. On Friday, they’d also attended a Conservatives4Palin meetup in Urbandale, where the Palins made a surprise visit. At both events, though, the Adamses were pretty disappointed that they’d been unable to get through the crowds to meet the former Alaska governor. Diane Adams told her husband that Palin started the race in the back of the pack, among the walkers, keeping a low profile for as long as possible. Then she ran around them, and took off. After Palin finished – she’s a veteran runner and kept a speedy pace, finishing the 13.1-mile course around the lake in 1 hour 46 minutes and 10 seconds—she visited with the Adamses for while and took a picture with them.